Vegetables gardens are often a labor of love. They provide healthy produce for your family that you can enjoy fresh from the garden or preserve by canning or freezing. Pests, such as birds, rabbits, deer, slugs or other insects enjoy feasting on the produce and foliage. This may destroy the vegetable plants or result in a loss of your harvest. 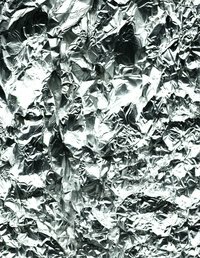 Aluminum foil is useful in protecting your vegetable garden from these predators. Tear off a strip of aluminum foil that is approximately 36 inches long. Fold the aluminum foil in half and then in half again to form a stiff foil strip. Join the two ends of the foil strip together by bending them together to form a circle shape. This makes an effective collar to go around the base of your plants and it is helpful in preventing slugs and cutworms. Bury 2 or 3 inches of the foil collar into the soil around the base of your vegetable plant. This allows several inches to extend out of the ground, thus preventing the garden pests from attacking your vegetable plants. Tear off strips of aluminum foil that are 1 or 2 inches long. You will need several strips depending on the size of your garden. Shred or tear the foil into small pieces. Mix the foil strips into your garden mulch. The presence of the foil deters many insects. The reflection of sunlight from the foil provides extra lighting as well. Tear off 12-inch lengths of aluminum foil. Fold each piece of foil in half and in half again. Punch a hole in one end of each of the strips with a sharpened pencil or the pointed edge of a pair of scissors. Cut a piece of twine that is 8 to 12 inches in length for each foil strip. Insert a piece of twine into one of the holes and tie the ends of the twine together in a simple knot. Repeat this on each folded strip. Hang the foil strips from nearby tree limbs, fence posts or tall stakes. The strips flap noisily in the wind and deter deer, birds and other animals from your vegetable garden.